No person is self-made, and those who claim to be so are proud and dishonest. When READY FOR HIM TODAY finally emerged as a fully-fledged book, I knew that it was because of the efforts of many people, not simply because of my hard work. My name is on the front cover, but many other invisible names are also there. There are too many to mention or acknowledge, but I am grateful for all of them, and, in the next few posts, I want to acknowledge a few of the primary ones: my cover photographer, Lisa Manchester; my cover model, AB; and my best friend and marketing guru, CM. This first post is dedicated to Lisa Manchester, the woman who designed my cover. When I decided to create my own cover (as both a method of creative control and as a cost-saving measure), I knew that I could not do it on my own. First, my graphic skills are pretty much limited to pointing a digital camera at an object and pressing a button. Occasionally, I'll scribble something in my art pad if I feel particularly inspired, but when my more artistic sisters pronounce my creation to be "interesting," I know that writing is a better fit for me. My family has known Lisa Manchester's family for decades, and the wonderful afternoons of friendship and fellowship have blessed me greatly. When searching for the designer of "the perfect cover," my thoughts immediately pinpointed Lisa Manchester. Her skill and eye for beauty were evident by the professional photos of her family that she sent out every Christmas (and by the lovely family pictures on her website), her easy-going nature and attention to detail would make her easy to work with, and her love for the Lord would enable her to share my vision for READY FOR HIM TODAY. I didn't hesitate, and sent her an e-mail in November. "I know that your forte is family photography, but have you ever thought about making a book cover?" I outlined my idea for the cover and asked her if she thought she could do it. Her reply was more than enthusiastic (as evidenced by her liberal use of exclamation points) and we immediately began making plans. One weekend in January, my model, a few of my siblings, and I arrived at the Manchester home for the official photoshoot. To get the effect of a woman looking into a mirror and envisioning herself as a bride, we had to take two different shots: one of my model AB in plain clothing with her back to the camera, and one of her in her wedding gown in the same pose, with the focus blurred for her reflection. The backdrop consisted of a horizontal rod which suspended an enormous, rolled sheet of paper. Lisa unrolled the paper smoothly and swept it onto the floor, creating a backdrop without sharp angles, corners, or seams. The white oval-framed mirror had been a must in the props. Lisa and I had taken inventory of our friends' mirrors before the photo shoot date, but none had matched my vision. When I mentioned the problem to my friend AB, she had the perfect solution. "Our friend MG is at college, but she has exactly the type of mirror you're looking for." One phone call later, the perfect mirror had been secured. Lisa's children crowded around to watch and to offer willing hands to help with the props. We dug out AB's sister's wedding bouquet of artificial flowers, unpackaged a new bridal veil, and kept AB's infant son happy while his mother changed into her multiple outfits. I watched as Lisa took control of the situation with artistic precision, squinting through her viewfinder to test for the best shot, and instructing her helpers to angle the mirror a little more this way and the model to turn a little more that way. We originally chose pink for the backdrop, but later I decided on the cream color. This was because I felt that pink would appeal primarily to a certain segment of my potential readership, and misleadingly categorize READY FOR HIM TODAY as a "girly girl" book. Since I am "vertically challenged," I wasn't much help, but Lisa's height-endowed son (19 at the time) offered his services to hold up an additional backdrop of black at a right angle to the paper roll, to fill in the background for the bride photo. After we had said goodbye, the real work began. 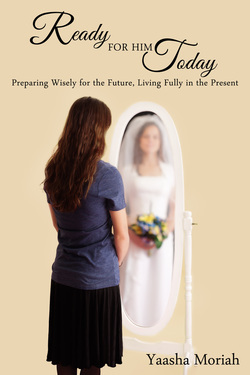 While I edited my manuscript like mad, Lisa spent hours in Photoshop, cutting and pasting the bride reflection into the mirror, fussing with the title and subtitle, and asking my opinion every step of the way. Lisa's artistic dedication to quality plus my literary perfectionism combined to produce multiple drafts, much e-mail communication, and some necessary delay as we worked together to produce something we felt accurately matched our vision. The first proof of the front cover shocked me; Lisa's choice of font and layout almost exactly matched my vision, even though I had never discussed any of those specifics with her. I took it as yet another proof that she was the right woman for the job! When I held my book in my hands for the first time, I reflected on a truth which had been growing in my mind since the beginning of the project. Now there are diversities of gifts, but the same Spirit. And there are differences of administrations, but the same Lord. And there are diversities of operations, but it is the same God which worketh all in all. But the manifestation of the Spirit is given to every man to profit withal... For the body is not one member, but many. If the foot shall say, Because I am not the hand, I am not of the body; is it therefore not of the body? And if the ear shall say, Because I am not the eye, I am not of the body; is it therefore not of the body? If the whole body were an eye, where were the hearing? If the whole were hearing, where were the smelling? But now hath God set the members every one of them in the body, as it hath pleased him. God had given me the gift of writing, but my gift by itself was not enough to do what I needed to do. So He had placed people in my life--people like Lisa--whom He had gifted with something else. Together, our gifts complemented each other and gave us both opportunities which we might otherwise never have had; Lisa's photography was now on a book cover and my book now had an inspiring image to represent its content. Our gifts proved the diversity and creativity of our amazing God, and the sharing of those gifts honored the spirit of communion which we possess through Jesus Christ.